'Achieving the goals set by world leaders in the United Nations Millennium Declaration will be difficult without a significant improvement in the lives of slum dwellers, and the lives of slum dwellers cannot be improved without the sound and sustainable economic development that is conducive to the establishment of a strong shelter sector. 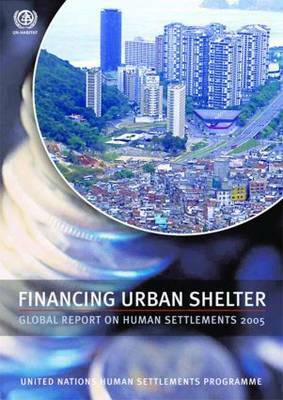 As Financing Urban Shelter: Global Report on Human Settlements 2005 emphasizes, one of the key challenges in meeting the Millennium Declaration Goal on slums is mobilization of the financial resources necessary for both slum upgrading and slum prevention by supplying new housing affordable to lower income groups on a large scale. Financing Urban Shelter presents the first global assessment of housing finance systems, placing shelter and urban development challenges within the overall context of macroeconomic policies. The report describes and analyses housing finance conditions and trends in all regions of the world, including formal housing finance mechanisms, microfinance and community funding, highlighting their relevance to the upgrading of slums. Recent shelter finance policy development is discussed at the international and national levels, and the directions that could be taken to strengthen shelter finance systems are examined. The Global Report on Human Settlements is the most authoritative and up-to-date assessment of conditions and trends in the world's cities. It is an essential tool and reference for researchers, academics, public authorities and civil society organizations around the world. The preceding issues of the Global Report on Human Settlements have addressed such topics as An Urbanizing World, Cities in a Globalizing World and The Challenge of Slums. Buy Financing Urban Shelter by UN-HABITAT from Australia's Online Independent Bookstore, Boomerang Books. The United Nations Human Settlements Programme, UN-HABITAT, is the United Nations agency for human settlements. It promotes socially and environmentally sustainable towns and cities with the goal of providing adequate shelter for all.